How can I tell if I have ad or tracking blockers? I’m not using ad or tracking blockers, but I’m still getting the ad wall. 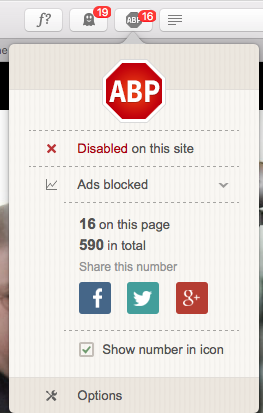 I’ve checked my ad or tracking blocking extensions, and The Atlantic is whitelisted in all of them. My workplace is blocking ads. I purchased the ad-free product, but I’m still seeing ads. I'm logged in to my Atlantic account for my ad-free access, but I'm still seeing ads. Ad or tracking blockers may still be running even though you whitelisted our site. To fix this, please go into your browser's extensions or add-ons settings, manually whitelist The Atlantic in those blockers, and then refresh the page. Please see this link for steps on how to manually whitelist The Atlantic by browser. Please ensure that you have whitelisted us for the entire www.theatlantic.com domain and not just the single article page you’re trying to view. If you’ve already followed the instructions for “How can I tell if I have ad blockers or tracking blockers?” and “I’m not using ad blockers or tracking blockers, but I’m still getting the ad wall,” please try switching to another browser. We cannot alter workplace ad blocking. Some workplaces have company-wide ad blocking that individual employees may not be able to opt-out of. Please check with your network administrator about the status of our site. 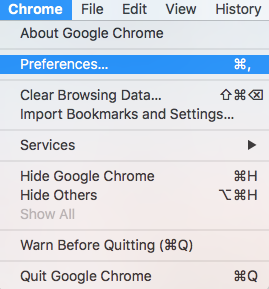 If you are using Firefox in private browsing, switch to normal Firefox to avoid the ad wall. 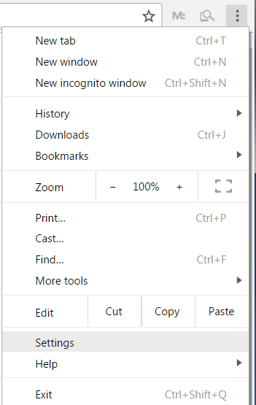 To continue using private browsing on other sites, disable Firefox’s automatic tracking protection using the first method below. The second method will disable it for all sites. Click the shield in the upper left-hand corner of your browser near the URL and then choose "Disable tracking protection for this session" as in the screenshot. 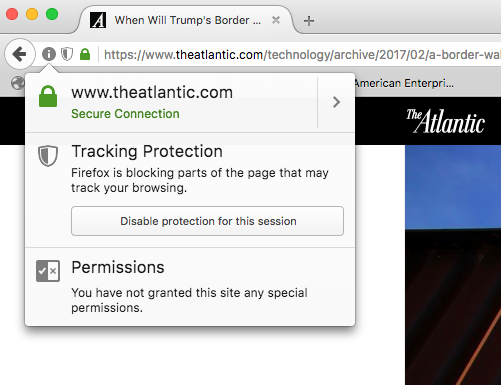 This disables tracking protection for only one session, so if you leave private browsing mode and then open it again to visit The Atlantic, you'll need to disable it each time. You may also disable tracking protection from the homepage, but this will disable tracking protection for other sites you visit as well. To disable: Click the green slider so that it turns grey. 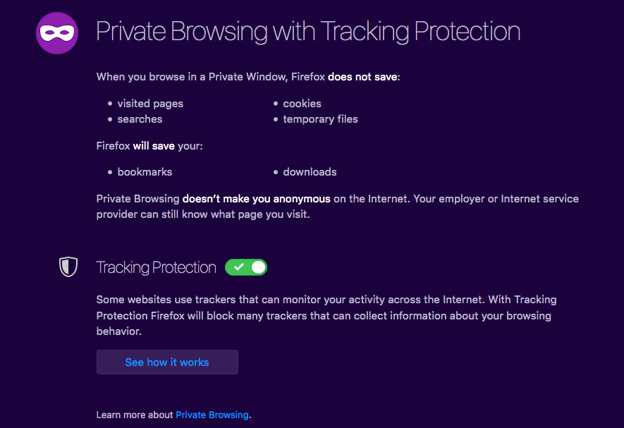 This disables tracking protection for current and future private browsing sessions. 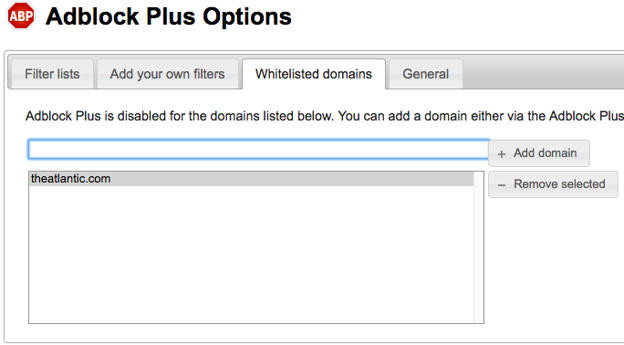 To whitelist us, select "Chrome" from your screen’s drop-down menu and then select "Preferences” and then “Extensions." "theatlantic.com" should appear there. If “theatlantic.com” is not already there, please add it to the list. (You may also disable any extension for all sites by de-selecting the box next to “Enabled” but this will disable the blocker for all sites). Please follow the first method below, and if the ad wall still appears, please try the second method. Select the gear icon in the upper right hand corner of browser, and then select "Manage add-ons.” Select "Toolbars and Extensions," and then check to see which add-ons you have running. If you do have Adblock Plus or Ghostery or any other ad or tracking blockers, make sure that the "Status" for them is "Disabled." Exit this window and then refresh the page at least once. 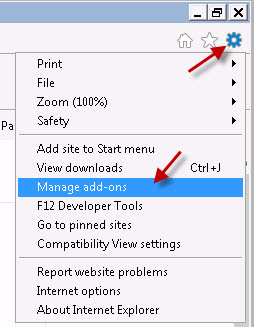 If you do still see the ad block, wall, following the same steps, return to the "Manage add-ons" window, but this time select "Tracking Protection" instead of "Toolbars and Extensions" from the list. Make sure the "Status" is "Disabled." Ensure that your extensions in your browser window toolbar have The Atlantic whitelisted. The screenshots below are general examples of how you would disable ad or tracking blocking extensions in Safari even if you do not have these particular extensions. For Adblock Plus, a site is whitelisted if Adblock Plus says that Adblock is “Disabled on this site” while on The Atlantic. 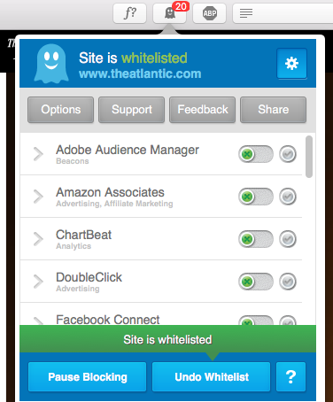 For Ghostery, a site is whitelisted if it states “Site is whitelisted” while on that site. Ensure you’re logged in to your account at accounts.theatlantic.com. Your ad-free access is associated with your online Atlantic account. If you’re not logged in, our site can’t tell that you have ad-free access. I’m logged in to my Atlantic account for my ad-free access, but I’m still seeing ads. Log out of your account and log in again or click this link on the device you would like access ad-free on. Your ad blocker may be blocking you from logging in. Please disable it and try logging in again.